Faced with the coalition government’s multiple schedules of cuts in public spending, which will mean increasing poverty and unemployment for millions (see article below), the reaction has often been one of shock and awe: where and how do we begin to fight back against such an onslaught? And looking across the channel, where millions have been out on the street resisting the Sarkozy government’s ‘reform’ of pensions, the response has often been: ‘why can’t we be more like the French? They really know how to protest over there’. among students who will be demonstrating against cuts in university funding and hikes in tuition fees. The problem facing workers here is that these and other reactions have been dispersed. In France, the demand to ditch the new pension reforms has been taken up by the whole movement, creating the possibility of massive mobilisations against not only this attack but all the others which the economic crisis is forcing the bosses and the state to impose. This doesn’t mean that the French are on the verge of revolution: there as well the state can count on its political and union apparatus to prevent a real unification and self-organisation of the struggle, despite small steps in that direction. In the UK, however, the fragmented nature of the response is more obvious: the fire-fighters are called out on one issue, the transport workers around another, and so on. And yet there is no doubt that the government’s attack is aimed at the entire working class, employed, unemployed, students, pensioners, part-time workers, and so on. There is a crying need for a mobilisation which all can identify with and join. In the past, the trade unions were a force that stood for the interests of the workers against the needs of capital. But for many decades now the unions have been part of the forces of order, tied to capital and an integral part of the state. They have to respond to workers’ discontent by calling strikes, but they will do all they can to keep strikes divided and ineffectual. 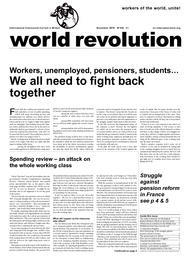 If there is to be a real response to the state’s assault on living standards, it will sooner or later have to break out of the official channels: workers will have to take charge of their own struggles directly, they will have to fight together and demonstrate together, raising common demands that can bring all the different parts of the working class into the same movement. Such a massive response won’t come out of nowhere: it can only be prepared by taking part in the existing struggles, however much they are contained and limited by the unions. But it is vital that those who see the need for a truly independent movement of the working class should begin right now to combine their forces and ideas.